LONDON - Holland & Barrett, the health products chain, is introducing what it claims to be the first chemical-free toiletry range from a high-street retailer. 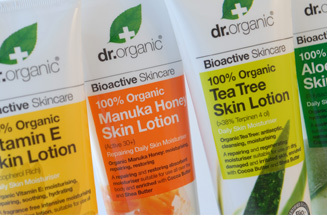 The 68-product lines, branded dr.organic, has been created without the use of parabens, SLS and GMO ingredients and mineral oils. Parabens, which act as preservatives in items such as food, as well as in cosmetics, have caused controversy in the past by having links with cancer, although recent studies have deemed them safe. Holland & Barrett's products include lotions, hair care, deodorant, toothpaste and body washes are available in a number variants consisting of Aloe Vera, Manuka Honey, Tea Tree, Vitamin E, Pomegranate and Lavender. Phil Geary, marketing director at Holland & Barrett, said that the range would be supported in-store and the company would look at using TV ads within the next six months to promote the new range. The products use Aloe Vera as the main ingredient where possible because most other cosmetic products are made up of between 50% and 70% water, which reduces their organic content.